Members of the Labour administration at North Lanarkshire Council joined trade unions at the Scottish Parliament to protest cuts to the local authority budget. Following the draft budget settlement announced by Cabinet Secretary for Finance and the Constitution, Derek Mackay MSP, the council faces having to make savings of around £22m next year. 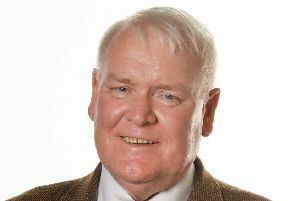 Council leader Jim Logue said: “Councils such as ours are at the frontline of dealing with austerity from both Westminster and Holyrood. “It is vital that we stand together with our trade union partners in speaking out for the most vulnerable who will suffer most from these swingeing cuts imposed by this Scottish Government. “The public have already seen some of the unpalatable decisions we have already had to consult on, such as changes to school transport, as a result of the Scottish Government’s disregard for local services. If this £22m cut transpires, it would mean the council has had to make almost £200m in savings over the last ten years. Councillor Logue said: “The Scottish Government’s draft budget settlement is disastrous for North Lanarkshire. “The public already see their services being squeezed on a daily basis and yet the Scottish Government have chosen to decimate their communities further still, with £22m of cuts to local services next year. “A meeting of the Labour Financial Scenario Planning Group on Friday morning began to assess the devastating impact of this proposed settlement and I have written to Derek Mackay asking him to meet with me in the new year to discuss the potential consequences of such a dire settlement for North Lanarkshire. The draft budget offers the option for local authorities to increase council tax by up to three per cent, North Lanarkshire decided not take up this option in February when it was offered previously.